Airplane! (1980) - Disaster Film. Airport 1975 (1974) - Disaster Film. Alien (1978) - Slasher Film. And Then There Were None (1945) - Slasher Film. April Fool's Day (1986) - Slasher Film. Arthur Christmas (2011) - Christmas Film. Behind the Mask: The Rise of Leslie Vernon (2006) - Slasher Film. Better than Chocolate (1999) - Lesbian Romance. Black Christmas (1974) - Slasher Film, Christmas Horror. Black Christmas (2006) - Slasher Film. Breakfast at Tiffany's (1961) - Manic Pixie Dream Girl. Bridget Jones's Diary (2001) - Rom Com. Bringing Up Baby (1938) - Manic Pixie Dream Girl. Bound (1996) - Lesbian Romance. But I'm A Cheerleader (1999) - Lesbian Romance. The Children's Hour (1961) - Lesbian Romance. A Christmas Story (1983) - Christmas Film. Conan the Barbarian (1982) - High Fantasy Film. Dante's Peak (1997) - Disaster Film. Dawn of the Dead (1978) - Zombie Film. Dawn of the Dead (2004) - Zombie Film. The Day After Tomorrow (2004) - Disaster Film. Daylight (1996) - Disaster Film. DEBS (2004) - Lesbian Romance. Deep Impact (1998) - Disaster Film. Desert Hearts (1985) - Lesbian Romance. 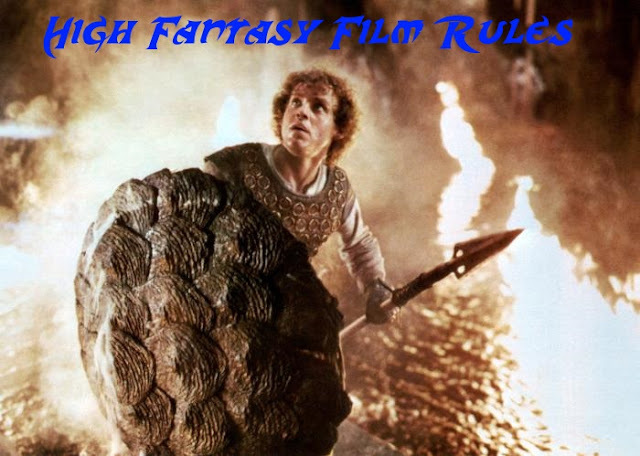 Dragonslayer (1981) - High Fantasy Film. Elf (2003) - Manic Pixie Dream Girl, Christmas Movies. Educating Rita (1983) - Rom Com. Elizabethtown (2005) - Manic Pixie Dream Girl. Eternal Sunshine of a Spotless Mind (2004) - Manic Pixie Dream Girl. Fire and Ice (1983) - High Fantasy Film. (500) Days of Summer (2009)- Manic Pixie Dream Girl. Four Weddings & a Funeral (1994) - Rom Com. Friday the 13th (1980) - Slasher Film. Friday the 13th Part 2 (1981) - Slasher Film. Friday the 13th Part III (1982) - Slasher Film. Friday the 13th: The Final Chapter (1984) - Slasher Film. Friday the 13th: A New Beginning (1985) - Slasher Film. Friday the 13th Part VII: The New Blood (1988) - Slasher Film. Friday the 13th Part VIII: Jason Takes Manhattan (1989) - Slasher Film. Friends with Benefits (2011) - Rom Com. Garden State (2004) - Manic Pixie Dream Girl. Halloween (1978) - Slasher Film. Halloween II (1981) - Slasher Film. Halloween 4: The Return of Michael Myers (1988) - Slasher Film. Halloween 5: The Revenge of Michael Myers (1989) - Slasher Film. Halloween: The Curse of Michael Myers (1995) - Slasher Film. Happy-Go-Lucky (2008) - Manic Pixie Dream Girl. Imagine Me & You (2005) - Rom Com, Lesbian Romance. The Incredibly True Adventure of Two Girls in Love (1985) - Lesbian Romance. Into The Storm (2014) - Disaster Film. It's A Wonderful Life (1946) - Christmas Film. Jack & Diane (2012) - Lesbian Romance. Jason Goes To Hell: The Final Friday (1993) - Slasher Film. Jason Lives: Friday the 13th Part VI (1986) - Slasher Film. Jason X (2001) - Slasher Film. Jaws (1975) - Slasher Film, Disaster Film. Knocked Up (2007) - Rom Com. Labyrinth (1986) - High Fantasy. Leprechaun (1993) - Slasher Film. Leprechaun 2 (1994) - Slasher Film. Leprechaun 3 (1995) - Slasher Film. Leprechaun 4 In Space (1996) - Slasher Film. Lost & Delirious (2001) - Lesbian Romance. The Monkey's Mask (2000) - Lesbian Romance. The Muppet Christmas Carol (1992) - Christmas Movies. My Best Friend's Wedding (1997) - Rom Com. My Summer of Love (2004) - Lesbian Romance. Night of the Living Dead (1968) - Slasher Film, Zombie Film. A Nightmare on Elm Street (1984) - Slasher Film. A Nightmare on Elm Street 2: Freddy's Revenge (1985) - Slasher Film. A Nightmare on Elm Street 3: Dream Warriors (1987) - Slasher Film. A Nightmare on Elm Street 4: The Dream Master (1988) - Slasher Film. Pan's Labyrinth (2006) - High Fantasy Film. Peeping Tom (1960) - Slasher Film. The Poseidon Adventure (1972) - Disaster Film. The Princess Bride (1987) - High Fantasy Film. Psycho (1960) - Slasher Film. The Return of the Living Dead (1985) - Zombie Film. Roman Holiday (1953) - Rom Com. Saw (2004) - Slasher Film. Scream (1996) - Slasher Film. Shaun of the Dead (2004) - Zombie Film. Silent Night, Deadly Night (1984) - Slasher Film. Silent Night, Deadly Night part 2 (1987) - Slasher Film. Sleepless in Seattle (1993) - Rom Com. Something Wild (1986) - Manic Pixie Dream Girl. Star Wars (1977) - High Fantasy. Stardust (2007) - High Fantasy. Sweet November (2001) - Manic Pixie Dream Girl. 10 Things I Hate About You (1999) - Rom Com. Tim Burton's Nightmare Before Christmas (1993) - Christmas Movies. The Towering Inferno (1974) - Disaster Film. 28 Days Later... (2002) - Zombie Film. Warning Sign (1985) - Zombie Film. White Zombie (1932) - Zombie Film. Willow (1988) - High Fantasy Film. The Wizard of Oz (1939) - High Fantasy Film. Wolf Creek (2005) - Slasher Film. World War Z (2013) - Zombie Film. Zombi 2/Zombie/Zombie Flesh Eaters (1979) - Zombie Film.